The Rock Harbor Trail is probably the busiest trail in the park. 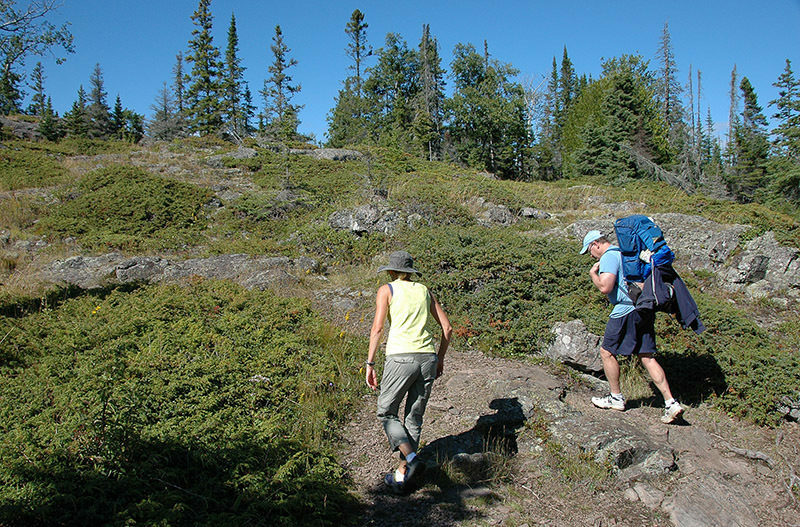 In midsummer, when the Ranger III pulls in, a stampede often results as hikers scurry down the trail to secure a shelter or campsite at Three Mile or Daisy Farm Campground. The first portion of the Rock Harbor Trail, the 7.2-mile trek to Daisy Farm, is an incredibly scenic walk along the bluffs of the shoreline, with constant views of the water. The 3.9-mile segment to Moskey Basin swings inland and is more difficult but not nearly as laborious as it used to be. The Rock Harbor Trail stretches is probably the busiest trail in the park. In midsummer, when the Ranger III pulls in, a stampede often results as hikers scurry down the trail to secure a shelter or campsite at Three Mile or Daisy Farm Campground. 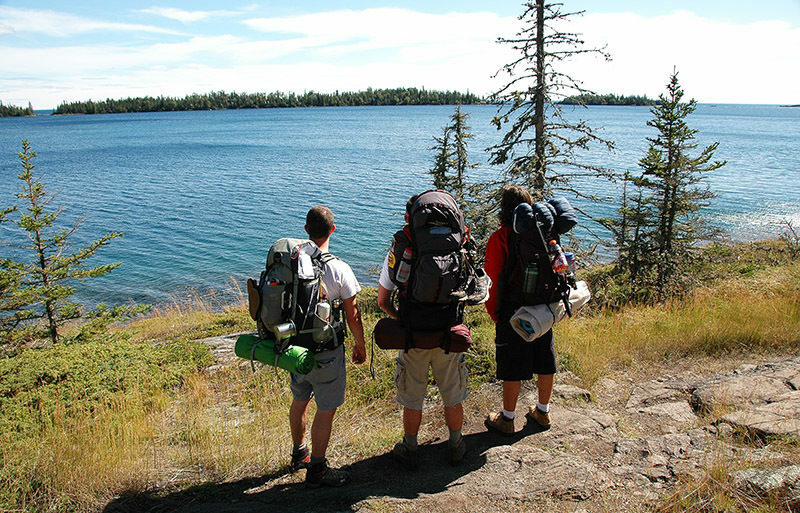 If just stepping off one of the ferries, you can hike to Three Mile Campground in 1.5-2 hours while Daisy Farm Campground is another 2.5-3 hours away. The first portion of the Rock Harbor Trail, the 7.2-mile trek to Daisy Farm, is an incredibly scenic walk along the bluffs of the shoreline, with constant views of the water. The 3.9-mile segment to Moskey Basin is not as scenic as it swings inland and is more difficult. 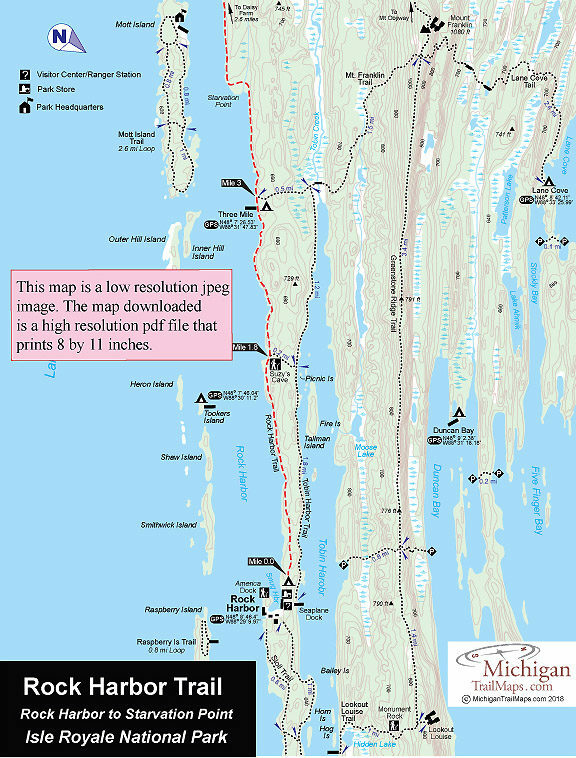 Rock Harbor Trail Map 1 covers the 4.6-mile stretch from Rock Harbor to just pass Starvation Point. Rcok Harbor Trail Map 2 covers the western half of the trail to Moskey Basin. 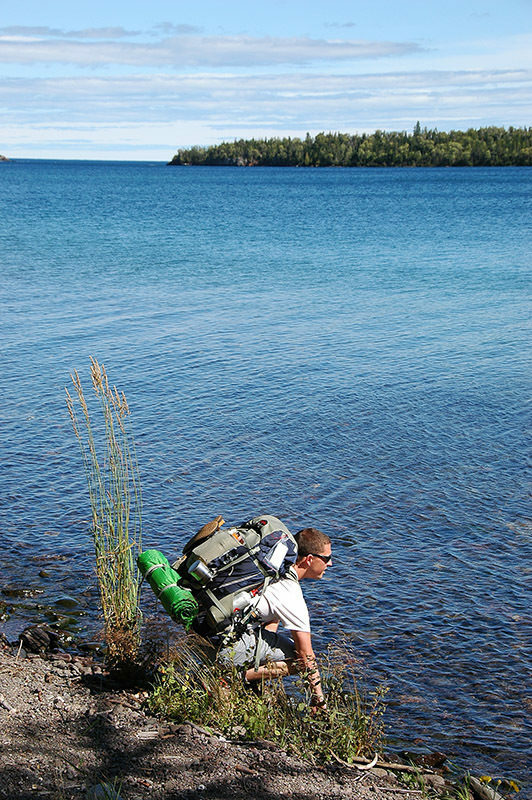 Rock Harbor connects three backcountry campgrounds, two in the first half. Three Mile (2.8 miles) is the first reached from Rock Harbor and is pleasant, situated right off the shoreline. But being so close to where the Ranger III unloads its passengers, it can fill up fast during the summer, the reason for its 1-night limit. Three Mile Campground has eight shelters, group and individual campsites, pit toilets, and, most unusual, two docks. From either you can listen to the water lap onshore in the evening or watch the waves rush through the gaps between Inner Hill Island and Mott Island across Rock Harbor. the second campground reached is Daisy Farm (7.2 miles) that falls in the same category as those at Rock Harbor and Windigo. It's a very popular spot to spend a night or even a couple of days and, consequently, has a lot of traffic. The campground has 16 shelters (often taken by early afternoon) and group and individual campsites. A ranger stationed here gives evening talks twice a week for most of the summer. There is also a large dock, from the end of which you can see Moskey Basin to the west, Mott Island to the east, and the restored Edisen Fishery straight across. You can utilize the water taxi service offer by Rock Harbor Lodge to be dropped off at Three Mile or Daisey Farm if you are short on time. 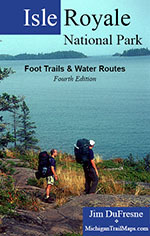 Rock Harbor Trail is covered with maps in Isle Royale National Park: Foot Trails & Water Routes by Jim DuFresne. To order the 184-page guide to the wilderness island, Click Here. 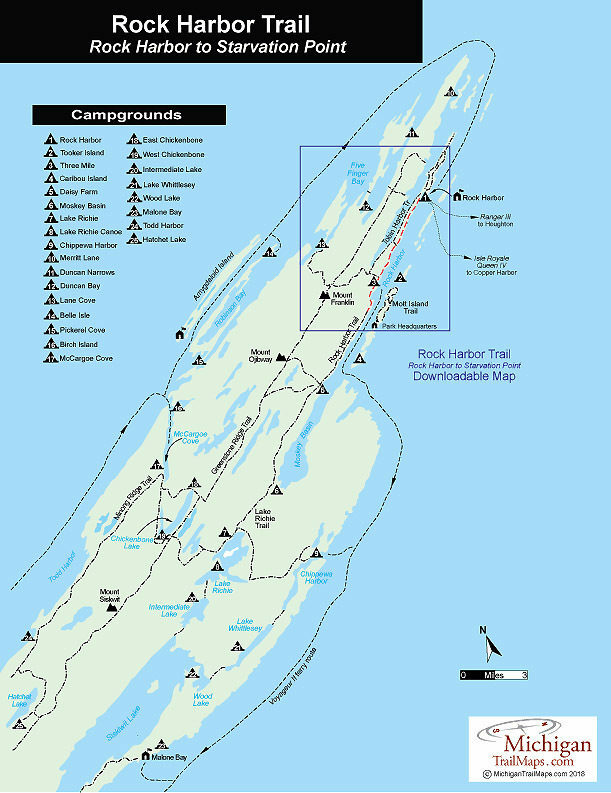 Rock Harbor Trail connects to four campgrounds. It begins at Rock Harbor Campground and then reaches Three Mile (2.8 miles) and Daisy Farm (7.2 miles) before ending at Moskey Basin (11 miles). Needless to say all four campgrounds are among the busiest during the peak summer season of July and early August. Shower tokens, clean towel, and bar of soap can be purchased at the camp store at Rock Harbor or Windigo. Some backpackers like to book a room for their final night at Rock Harbor, either at the lodge or in one of the housekeeping units that can be shared by six people and feature small kitchenettes. For reservations, contact the park concessionaire, Forever Resorts (866-644-2003 or 906-337-4993 in summer; www.isleroyaleresort.com). The Rock Harbor Lodge runs a water taxi that can drop backpackers and campers at Three Mile Campground, Daisy Farm Campground and Moskey Basin Campground. Contact the Rock Harbor Resort (866-644-2003 or 906-337-4993 in summer; www.isleroyaleresort.com) to find out current schedule and costs of its water taxi service.